Sweat guard does a good job although I would like to see these items with a bit more width to them. The cover is nice as it catches sweet and holds my energy bar, remote control and tissues while indoor training. I'm sure it will fit any bike configuration. 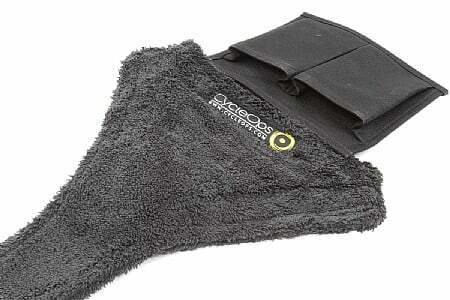 It's a nice sweat guard, pocket attachments can be better as they sometimes get in the way and knees hit them. It covers plenty of the bike from sweat, the best part is the pockets for me, it lets me put phone, or tv remote, etc... right where I can get to it while I am riding and don't have to stop for anything. I did not realize how much you sweat on a trainer when there is no wind. I drip sweat off my chin and nose, which would usually land on my frame. Sweat can be corrosive to some items, so the Cycleops bike thong is great at not being in the way catching all those sweat drips. This item delays your bike getting sweat on by 15 min. It consists of a thin towel which absorbs sweat and then funnels it directly into your bike parts where it causes damage. Obviously, a major design flaw, and no good for any athlete doing a serious indoor workout. What can i say...it soaks up sweat. I also like the front pockets to store items such as a phone, ipod, or remotes. Have been working out on my trainer with a new computer training program. Slob that I am..the sweat has really annoyed my Madone. Not only is the thought of a Thong exciting..but the Madone is beautiful wearing it. No more sweat.